"Shot on Nokia 9 for real"
After its debut during MWC 2019, HMD Global's penta camera phone - the Nokia 9 PureView is all set for its launch in UAE. The company announced today that the phone will be available from May onwards, priced at a very respectable AED 2,299. 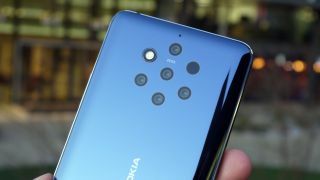 With the Nokia 9, HMD Global brings back Sony's Carl Zeiss optics and tops it up by adding Light's lux capacitor for image processing. Hence, there are some big expectations tied to the camera prowess of the Nokia 9. The phone features a 5.99-inch POLED display with QHD (2880 x 1440 pixels) resolution and is layered with Gorilla Glass 5 for added protection. In addition, the display on the Nokia 9 PureView is HDR10 compliant which makes it one of the better phones to watch content. Nokia 9 is powered by Qualcomm Snapdragon 845 chipset with an octa-core CPU, coupled with 6GB of RAM and 128GB of storage. The phone runs on Android 9.0 Pie and is part of Google's Android One program. The five cameras on the phone consist of 12MP snappers optimized by Carl Zeiss. Two of those sensors are RGB while the other three are monochrome which works simultaneously to capture a frame. Additionally, there's a Time of Flight (ToF) camera as well which assists in depth sensing. On the front lies a 20MP camera for selfies. The fingerprint sensor is embedded into the display itself and there is a 3,320mAh battery to boot which supports both 18W fast charging and 10W fast wireless charging.